Log into your Donorhut control panel: Log into My Hut. Click the "Campaigns" link in the top address bar. Click the title of your campaign that received the donation to open the campaign details. 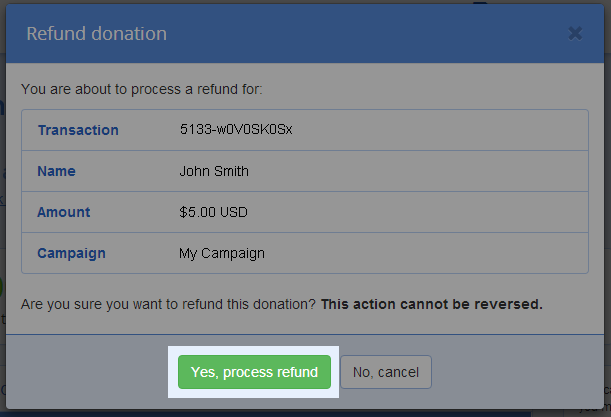 Under the "Donation History" click the "Refund" button beside the donation you wish to refund. Review the details of the transaction and verify it is the correct transaction. Once you confirm it is the correct transaction click the green "Yes, process refund" button at the bottom of the dialog box. Refunds cannot be reversed.